How Long Should Your Band Saw Blade Last? board footage when cutting softwoods. Now that you have the answer, you can skip the rest of this article (just kidding!) Here are some tips on how to stretch out the useful life of band saw blades to get the most for your saw bucks. A common question new sawyers (or aspiring sawyers) ask is how much life they can expect from a band saw blade. There are so many variables involved that a simple answer is almost impossible. On the other hand, understanding these variables will help you get the most possible life out of your blades. First, the band saw blade is an amazing combination of steel alloys, precision sharpening, heat treating, and welding. The body of the blade is a carbon/silicon/steel alloy that is resilient enough to bend and straighten out hundreds of times each minute of operation as it goes around the band wheels, without breaking from fatigue. After grinding or cutting the profile, 1/8” of the tip of teeth are heat treated to hold the edge. Then the blade gets a final sharpening and set 0.020 inch to increase the kerf, allowing the body of the blade to slide through the cut without resistance. Cutting and welding is an exact process that creates a band with no weakness or roughness as the razor sharp teeth slice their way through each cut. Then the most amazing part of the process takes place… these marvels of manufacturing sell for only between $18 and $30 each! Slabbing cuts are the toughest on the blade. Clean as much dirt from the cutting line as possible and, if possible, turn the log so that any dirt is on the exit side of the cut. Keep your logs clean. If you have control over moving them, avoid dragging the logs through dirt. It is amazing how quickly a little dirt embedded in the bark will take the edge off a tooth. If you see dirt or mud, get rid of as much of it as possible before you cut. There are several debarkers available, but I have found that the claw end of a framing hammer is the quickest. Wear safety glasses when you do this, by the way, because dirt and bark will come back at your face. If you can’t get all the dirt out, turn the log so that it is on the exit side of the cut so that the blade pulls it away from the log instead of dragging it through the cut. In some cases, you might rotate the log 3/4 of the way around for the second slabbing cut so that the blade enters into clean wood. No matter how you do it, most of the wear on the blade comes from cutting through the bark. Smaller logs, of course, mean cutting through more bark to yield a given amount of lumber, and will significantly reduce your blade life. Use the proper tension and tracking. Conventional “wisdom” is to crank more tension into the blade if it isn’t cutting straight. This puts more stress on the blade, increasing the possibility of it breaking. Instead, make sure the blade is tracking properly on the band wheels, and that the guides are set properly. If your blade uses guide blocks instead of rollers, try tracking it back on the band wheels to keep it from diving, or forward to keep it from rising. Pay close attention to whether the blade rises or falls as it exits the end of the end of the log. Inadequate tension can also shorten blade life, as it is more likely to set up vibrations that fatigue the metal, and put stress on the blade when it dives or rises in a cut. Speaking of tension, be sure to loosen the blade when you are finished for the day. Leaving it under tension can cause it to take a set where it is in contact with the band wheels, which can cause vibration and fatigue while cutting. Use blade lubricant. Running water on the blade helps it run cooler. A hot blade expands and loses some of its tension. If you experience pitch buildup on the blade, add some Pine-Sol to the water to keep the blade clean as it cuts. Metal like this bolt in the middle of a beautiful walnut log ended the life of a new blade. Just another day at the sawmill. Species also has a lot to do with blade life. The harder the wood, the shorter the time between blade changes—not only because hard woods tend to dull the blade more quickly, but also because it takes a sharper blade to slice through it. In fact many sawyers cut hard wood, such as hickory or oak with a sharp blade, then set the blade aside to cut softer wood when it no longer cuts the hard wood easily. That way, they get the most out of each blade. Blade geometry has an effect on its cutting properties. A sharp angle (10 degrees) has an aggressive slicing action perfect for soft woods, but loses its edge more quickly than, say a 7-degree blade angle, which has more of a scraping action that gives it a longer life in hardwood logs. What about blade width? 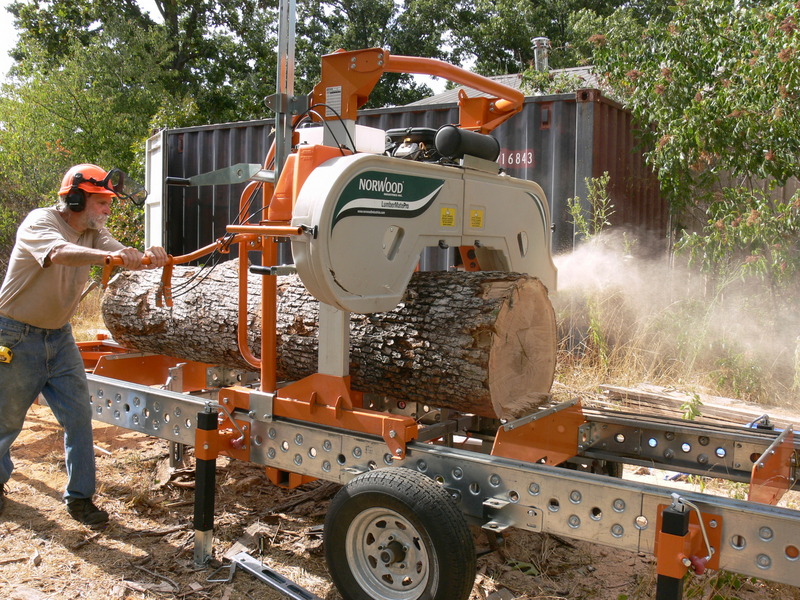 Most manual sawmills are designed for 1-1/4” wide blades, but can take 1-1/2” wide blades. With engines below 25 horsepower, the 1-1/4” blades are actually better, because they take about 3 extra horsepower just to run that extra metal around the band wheels. With more engine power and power feed, you can get more yield out of the wider blade because it will cut straight even after it is too dull to push by hand. Also, remember that wider blades need about 15% more tension to get the same pounds-per-square inch tension on the blade as the standard blades. All of this can stress manual sawmills beyond their design capacity and shorten the life of belts, bearings and the tensioning system. 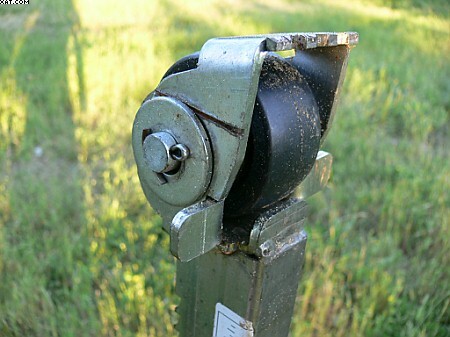 You will probably cut into a log stop or clamp once or twice in your sawing activities. Just put on a fresh blade, learn from your experience, and get back to making sawdust! Then, of course, there is the unforeseen. Those nails that some kid used to attach the steps to a tree house, fence wire, steel posts—even bullets with steel jackets—will turn a brand new blade into scrap metal before you can utter your first expletive. In my experience, metal detectors are too time consuming and unreliable to be worthwhile. 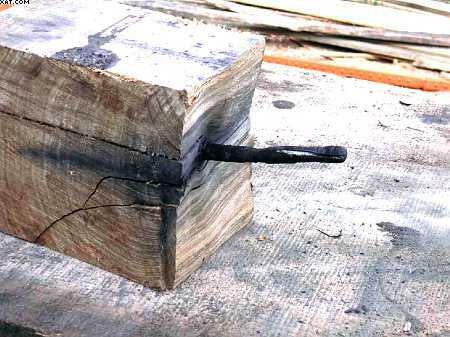 Even metal in plain sight can cause a blade’s sudden demise, as anyone who has sawn into a log stop or clamp can attest. You can extend the life of a blade by sharpening it. There are professional sharpening services, but the cost of shipping the blades and sharpening may well equal the cost of a new blade. Others sharpen the blades themselves. Whether this is worth the time is debatable, and depends on your equipment, how many blades are involved, how you value your time. Finally, all blades are not created equally. Ask around, and you will probably get a variety of answers as to what brand works best. Some feel that cheap, disposable blades cost less, while other prefer to invest more money in better quality blades with longer life. What works for you depends on the kind of cutting you do, but it won’t be long before you have enough of your own experience to offer an opinion when a new sawyer puts that question to you. At very least, you know enough to smile sagely and reply “it depends”.